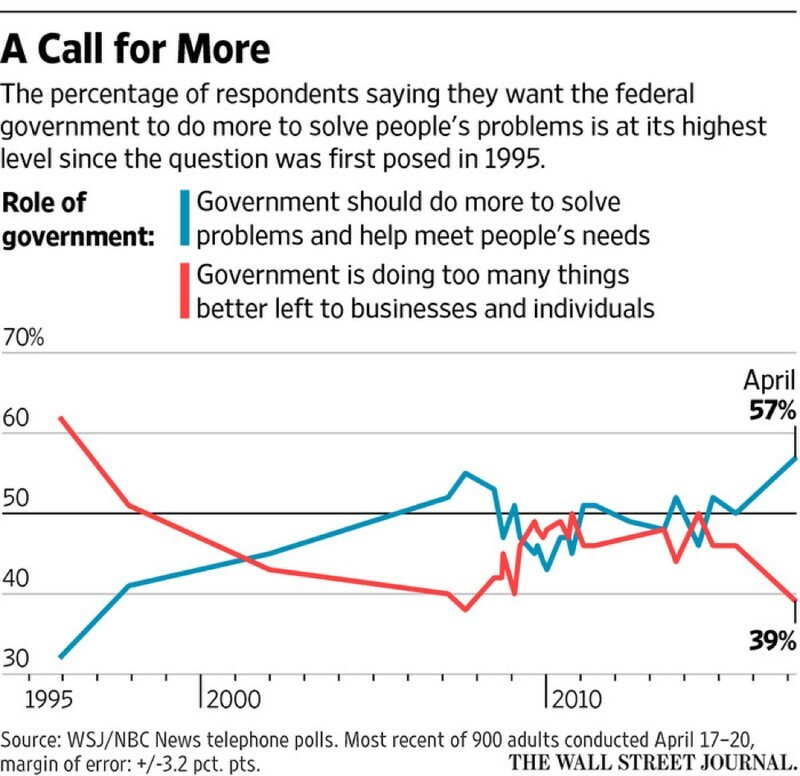 This metric–support for government–is the foremost “line in the sand” separating liberals and conservatives. Liberals are winning the battle. But who will win the war? Even with (or because of) a hard-right administration, Americans increasingly prefer liberal policies. There is no turning back. Watching the day-to-day misadventures of the Trump administration is like binge-watching the show American Greed. Everybody’s out for themselves. Lip service is paid to the “long-suffering American worker.” But can you name one initiative–executive order or failed legislation–that would materially help working people? 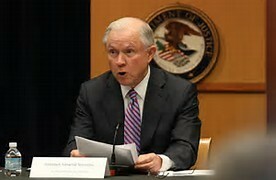 Prominent among the rogues gallery inside the Trump administration is wannabe Klansman Attorney General Jeff Sessions. 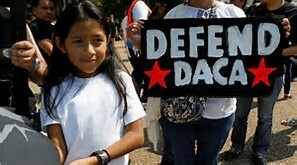 He was the driving force behind ending the Deferred Action for Childhood Arrivals (DACA), pulling the welcome mat from the children of undocumented immigrants. The decision was not only mean-spirited but so economically unsound that a consortium of companies such as Microsoft, Facebook, Hewlett-Packard and Amazon have publicly pledged to defend their “dreamers” in court. That’s a point well-taken. Because those days are gone. They’re not coming back. 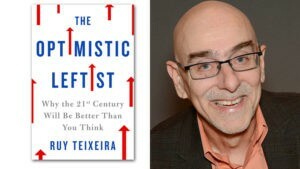 And despite this last gasp of white conservative indignation, the future belongs to those who feel comfortable navigating the raging tide of human progress. Support for immigration has ebbed and flowed throughout American history. In times of economic malaise, there always seemed to be a demagogue lurking behind his bully pulpit, ready to blame the new folks for lack of jobs or upward mobility. Two recent polls suggest the American public does not support the Trump administration’s xenophobia. 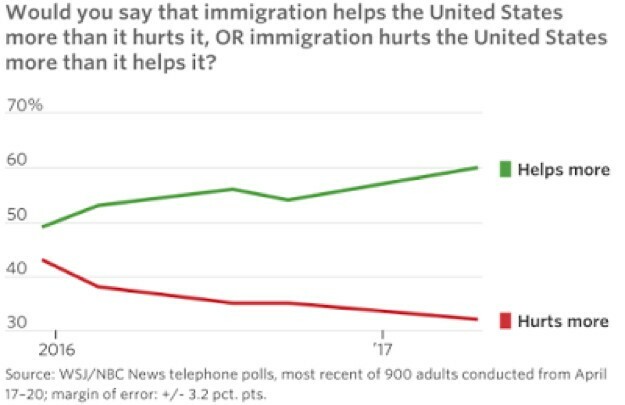 An NBC/Wall Street Journal poll (see graphic, below) decisively illustrates that positive feelings about immigrants have been on the rise since Trump took office…this despite the harsh rhetoric and clumsy attempts to ban certain immigrant groups. 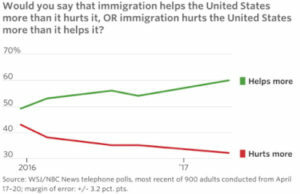 When NBC/WSJ started polling the question in 2005, only 37 percent thought immigration helped more than it hurt. This upward trajectory seems unstoppable. Trump’s harsh rhetoric about immigration has not turned the tide of public opinion. In fact, it has done the opposite. But it’s more than just a whip count. There has never been an instance when a government program that materially improves the lives of American has been “repealed and replaced.” Social Security and Medicare have been woven into the fabric of American society. The ACA and its future cousin, a single payer health system, is here to stay. But don’t take my word for it. Here’s conservative columnist Charles Krauthammer: “A broad national consensus is developing that health care is indeed a right. This is historically new. 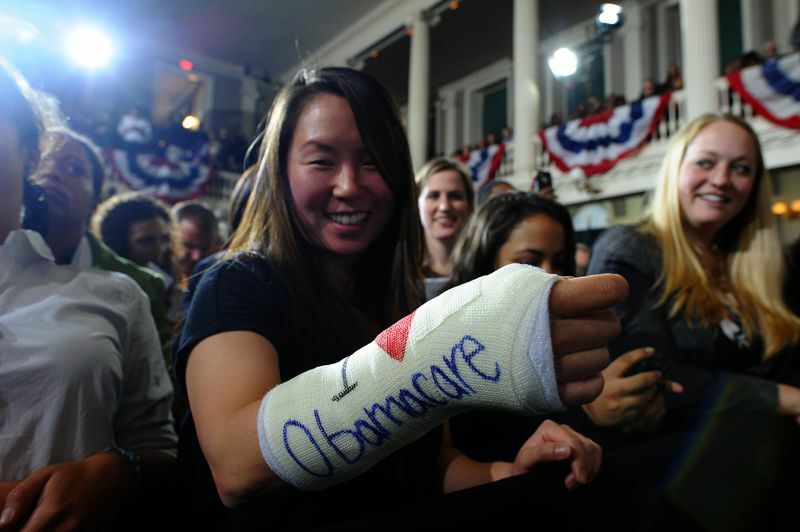 And it carries immense implications for the future.” Americans want their health care. There is no turning back. 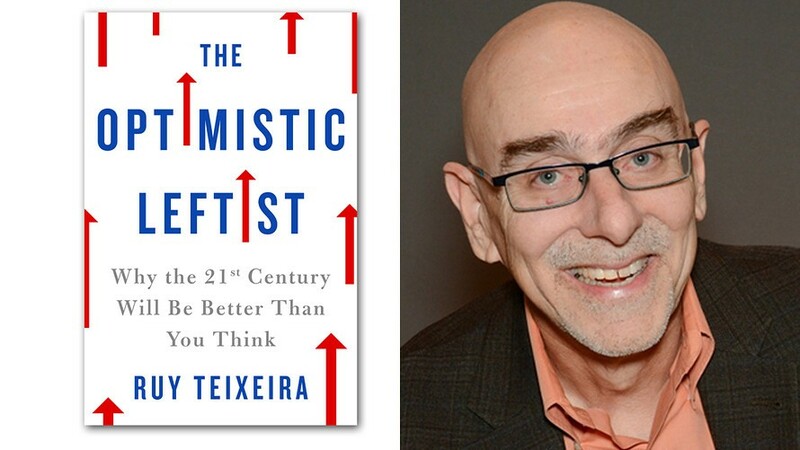 We can all use a dose of optimism in the Age of Trump. Name any issue on the American agenda. How about climate change? Yes, we all know that 97 percent of scientists support the view that the earth is getting warmer, the seas are rising, caused in large part to the release of fossil fuels into the atmosphere. Issues such as clean energy, clean water, globalization, science and technology, progressive taxation and financial regulation fall right into the liberals’ bailiwick. Trump and his minions can and will do their damage around the edges. But, as we have seen, public opinion properly mobilized can stop a lot of mischief dead in its tracks. 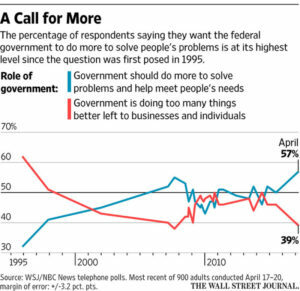 Most Americans like most government programs. Most of the time, we want government to do more and spend more. It is no accident that programs of the so-called welfare state…were created…and sustained…by massive public support. America is already great because of the institutions we created. 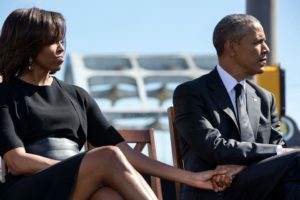 We have a president and the tyranny of a minority who want to tear it all down. We won’t let them. We have public opinion on our side.